SINGAPORE'S red-hot manufacturing sector shifted into a lower gear last month as declining electronics production tempered a surge in biomedical output. Factories cranked out 4.6 per cent more output in April from a year earlier, easing from the expansion of 13.2 per cent in February and 12.1 per cent in March, the Economic Development Board (EDB) said yesterday. OCBC economist Selena Ling said the slowdown "should be viewed as a breather and not a stalling of the domestic manufacturing recovery", given the sector's recent strong growth. But the key electronics cluster, which accounts for a third of output, could remain a drag on the sector as Singapore's economic restructuring and factory downsizing take their toll. All other manufacturing clusters reported higher production in April from last year, the EDB said. Biomedical output jumped 23.8 per cent last month, supported by strong drugs production. Without it, overall factory output would have fallen 0.7 per cent. Chemicals output climbed 8.9 per cent, precision engineering grew 4.2 per cent, transport engineering rose 3.5 per cent and general manufacturing increased 0.8 per cent, according to EDB data. But electronics shrank 8.8 per cent last month from a year ago, weighed down by an 11 per cent contraction in semiconductors, which makes up a fifth of the electronics segment. This was due to a "firm-specific factor" rather than an industry-wide trend, said the EDB. "It is important to reiterate that this is a one-off drop, attributed to a single company, and for reasons specific to the company," said Mr Terence Gan, EDB's director of electronics, in response to queries from The Straits Times. He added that the company in question "is growing in Singapore in other areas". The EDB could not give details due to confidentiality reasons, but stressed that Singapore "remains an attractive investment location for electronics companies". 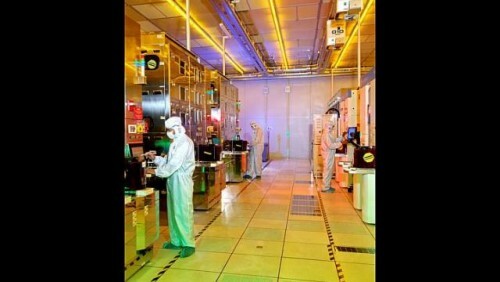 But that single company's effect on the semiconductor scene will be felt for a while. "Although this is a one-off event, the decline will be registered in the year-on-year growth for the rest of the year," the EDB said. Economists said this could be a sign that Singapore's productivity drive is having a bigger impact on manufacturing than other sectors. Bank of America Merrill Lynch economist Chua Hak Bin said "restructuring and the stricter foreign worker policy may be disproportionately hurting manufacturing". He cautioned that the "one-off event" in the semiconductor segment "may be a sign of things to come, as firms choose to relocate or invest their manufacturing capacity elsewhere". In December, data storage firm HGST axed 530 workers when it moved its Singapore plant to Thailand, while semiconductor firm Globalfoundries laid off 150 staff. Dr Chua also noted "tentative signs" that curbs on foreign workers are crimping growth in the services sector, which was weaker than expected in the first quarter. But some economists are optimistic that the manufacturing sector will hold up. "Though the weakness in electronics was disappointing, we remain confident that Singapore will continue to benefit from the ongoing recovery in the United States investment cycle," said Barclays economist Leong Wai Ho, noting that "there have been more convincing signs (of this trend) in exports of late". Factory output dipped 4.7 per cent in April compared with March and would have slid a steeper 7.3 per cent if the biomedical segment was excluded, the EDB said. Though the weakness in electronics was disappointing, we remain confident that Singapore will continue to benefit from the ongoing recovery in the United States investment cycle. There have been more convincing signs (of this trend) in exports of late. (The slowdown) should be viewed as a breather and not a stalling of the domestic manufacturing recovery.